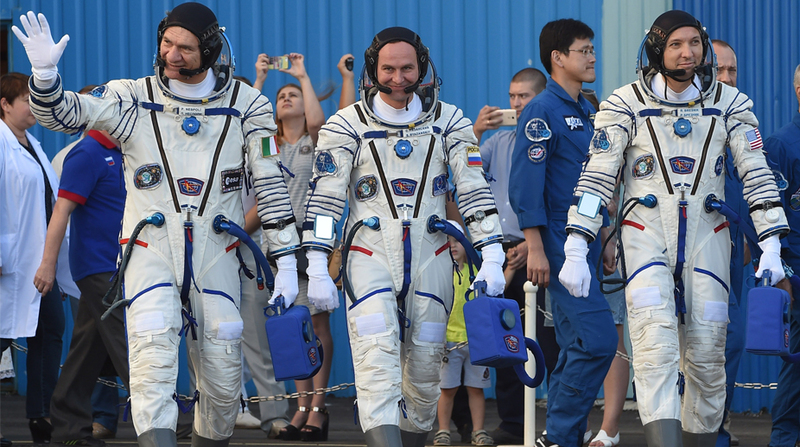 A three-man space crew from Italy, Russia and the United States has arrived at the International Space Station for a five-month mission. Footage broadcast by Russia's space agency Roscosmos showed the Soyuz craft carrying NASA astronaut Randy Bresnik, Russian cosmonaut Sergey Ryazansky and Paolo Nespoli of the European Space Agency take off into the dusky sky from Kazhakstan's Baikonur cosmodrome. Six hours later, after orbiting Earth four times, the Soyuz docked with the space station. The hatches between them were to open later, after pressurisation and leak checks are carried out, according to the US space agency NASA. NASA has responded to Russia's reduction by boosting the number of astronauts that will operate in its half of the ISS. In total, four astronauts — Peggy Whitson, Jack Fischer, Bresnik and Nespoli — will now conduct experiments in the NASA-run segment, with Ryazansky joining Fyodor Yurchikhin to man the Russian section. "There is a ton of science to do," he said ahead of the flight. Bresnik — who is on his second flight — also praised the work of Whitson, Fischer and Yurchikhin, already aboard the orbital lab. "They've really got their groove on. They are working very, very well. They have good technique and tempo," he said. Live footage broadcast on Roscosmos's website showed the toy gnome hanging inside the capsule as the trio prepared for takeoff. At 60 years old and with 174 days logged in space, Nespoli is the most experienced of the three fliers, but the Italian made it clear his love for space travel hasn't faded over time with a tweet showing him pulling his space suit on Friday. "Beam me up S…oyuz! Hitching another ride soon to the @Space_Station," he wrote. Roscosmos has said its two-man crew format will help it save costs while the ISS waits on the arrival of a long- delayed Multipurpose Laboratory Module that will generate enough work on board to justify a third cosmonaut on board.